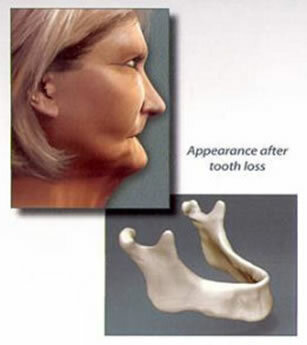 Tooth loss leads to Bone and premature aging and additional tooth loss. Losing one or more of your teeth start a chain of events that can have dire physical and cosmetic consequences. The most obvious result is a gap in your smile. Less obvious is the loss of chewing function and the inability to eat a complete diet that can result from tooth loss. While these are certainly serious issues, a potentially bigger problem lies hidden beneath the surface: Bone loss. Your jawbone needs the chewing action of the teeth to stimulate it and keep it strong. Otherwise it will begin to disappear (atrophy). Without teeth you jaw will literally melt away. Without the support of your teeth and facial bones, your face will begin to look prematurely aged. Tooth replacement with dental implants offers the only solution to help prevent bone loss. 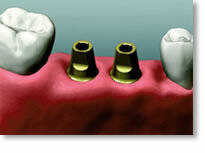 Dental Implants provide structure and foundation. Modern dental implants are precision devices, available in several different designs to address your specific needs. The most common type is a titanium man made root that is gently placed the jaw where it serves as foundation for a custom-made tooth crown. Once the crown is in place, you may not be able to tell it apart from your natural teeth. Crown & Bridge also requires that two or more healthy teeth be ground down to serve as abutments (posts) for a bridge, leaving them at a much greater risk for cavities and root canals. If the original fixed bridge fails (50% failure at 15 years), more healthy teeth must be cut down to serve as abutments, while you continue to lose bone beneath the bridge. With implants, however, the healthy teeth are left alone. Dental implants, like natural teeth, also transmit chewing forces to the jawbone, which reduces or eliminates bone loss. Dental implants can be expected to last you life time without replacement. This is why many leading dental organizations now recognize dental implants as the standard of care for tooth replacement. 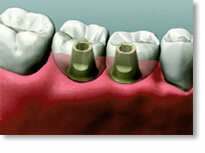 Dental Implants provide structure and a foundation. 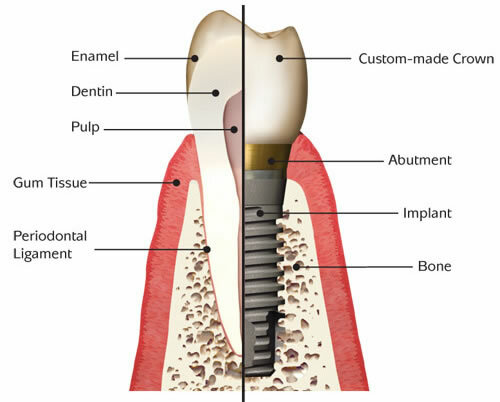 The implants are placed in the bone below the gum tissue After healing, the final abutments are attached to the implants. They will hold custom-made bridge. The custom bridge is cemented onto the abutments. The teeth have been replaced without disturbing healthy teeth and bone loss has been halted. Dental implant-supported prostheses can increase patient comfort. Several options are available to stabilize dentures using dental implants. The most stable is an implant-supported overdenture using several implants. Not only do the implants stabilize dentures but they also stimulate the jaw, reducing the effects of bone loss. The implants are placed in the bone below the gum tissue. A temporary abutment may be placed on the implant until the healing phase is complete. Once the implants have healed, a bar is attached to the implants. Ball attachments on the bar match attachment sites on the denture. The new denture will snap or clip into place. The implants are placed in the bone below the gum tissue. After healing, a bar with ball attachment points is attached to the stabilized implants. Modified dentures with receivers will attach to the ball attachment points. The new teeth are firmly supported by implants, stimulating the jaw and halting bone loss. The denture is easily removed for cleaning. A Hybrid Fixed implant-supported prosthesis provides stability. Several options are available to stabilize dentures using dental implants. The most stable is a fixed implant-supported prosthesis using several implants. Not only do the implants stabilize dentures but they also stimulate the jaw, reducing the effects of bone loss. Just as other procedures, implants are placed in the bone below the gum tissue. Once the implants have healed, a custom bridge will be fitted to your jaw. The bridge is created with access holes that allow it to be attached directly to the implants. The screw holes are then covered after insertion. A hybrid bridge implant restoration replaces missing teeth, gum and bone. Hybrids are fixed to dental implants placed in your jaw. A Hybrid Bridge will allow you to eat virtually anything and will last a lifetime will minimal maintenance. A Hybrid restoration could be your solution to the endless cycle dentistry. A hybrid bridge restores full dental function and provides superior levels of comfort and confidence. It looks feels and functions more like your natural teeth. The implants are placed in the bone below the gum tissue. 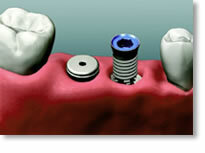 You will be fitted for a hybrid bridge that screws directly into the implants. The hybrid bridge is firmly supported by the implants. The new teeth are now firmly supported by the implants, stimulating the jaw and reducing bone loss. Your dentist will be able to remove the bridge when necessary for cleaning and maintenance. No, it is usually done under local anesthesia and all procedures will be done in Dr. Scotto’s office. The discomfort you may feel should be minor. Dr. Scotto may prescribe medication to alleviate any pain you may have. Depending on the location and the number of implants, they may be placed in as little as 30-60 minutes. You will be given a diet outline for the first few days, which will include soft foods. The entire process usually takes from 3 to 9 months, depending on your treatment plan. This gives the bone time to heal and attach to the implants. A single tooth can be $2,800 to $3,600, and a full arch (8-10 teeth) hybrid bridge from $19,000 to $26,000 without bone augmentation (which may not be necessary). Like most elective procedures, dental implants are not always covered by dental insurance plans. However, the staff at Dr. Scotto’s office will explain your insurance coverage and payment options.